Raising duck farm for eggs is little bit difference with raising cattle duck. Even they are same as duck but the main goal and the type to earn something of the duck needs different treatment. As we know beside the cattle, eggs are the main profit that we can earn from duck farming. Reprocess of duck eggs are pretty popular in our society and that’s why it has their own market. The quality eggs come from healthy duck and to make a healthy duck farm we surely need some efforts. It may hard for people who are still new in this business but actually this is experienced learning which you can do it directly. There is so much duck breeds to produce the duck eggs but you better choose the duck breeds that able to produce a lot of eggs in one pregnant period. Also, the duck which had heat period more than 2 times per year can also be your considerate. But don’t worry to make you easier, here are some best duck breeds to farm for eggs that can be considerate to be selected and rise. This duck also known as Javanese duck because their population which high in Java. During the time and high request, so their spreading is out until the area which far from Java Island. But now this duck names is following where the area their stayed. As mentioned before, Indian runner is now transforming into their named-area. Basically this duck is still as Indian runner type but it different name. Name as Mojosari duck, Magelang duck, and Tegal duck are some popular name for duck eggs. Mojosari duck included as high duck eggs which came from Mojosari, East Java Indonesia. The body tends to small but the egg that produced by this duck is pretty big for their small body. It also has high productivity which they can reach 150 eggs/per one duck/per year. This result can be expanded with intensive program and can reach 250 eggs/per duck/per year. This duck lays their eggs in 6 months old and after 7 months old started to stabile productivity. Another local duck Indonesia named Magelang duck is also popular because of their productivity which can reach 200-230 eggs/per duck/per year. 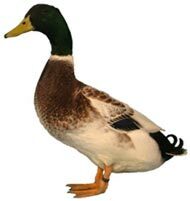 This duck is easy to remember because of there is feather like necklace on their neck so some people calls them necklace duck. And the last of Indonesian local duck which popular with their high productivity is Tegal duck. Tegal duck comes from Tegal, West Java Indonesia. The color of this duck is variative and every each of color has different name. This duck can face long far trip so the farmer usually use traditional ways with spread in natural as free. This duck can produce eggs until 250 eggs/per duck/per year and started to produce in 5.5 months old. Alabio duck comes from Alabio in Hulu Sungai Utara in South Kalimantan Indonesia. This duck able to produce 300 eggs/per duck/per year and they have great immune which protect them for any disease. They also growth quickly and the meat is tasty. Their egg size does smaller so to increase their egg, this type usually crossed with another duck type. The example of this crossed between female duck of Alabio with male duck of Mojosari which named as Queen and King. This duck is crossed of Javanese duck and Rouen duck of France. Khaki Champbell duck can produce 330 eggs/per duck/per year if you pet as intensive program. The eggs that produced by this duck tends to small but fortunately this duck has high immune which can protect them by any disease. The color of the egg also not too received by Indonesian people because of they are already getting used with green-tosca eggs. Queen duck is crossed from female duck of Alabio and male duck of Mojosari. The queen duck can produce 260 eggs/per duck/per year, the size is same and high immune so enough of disease protected. Queen duck is totally got the special things of their parents. This duck start to lay their egg in 4.5-5 months old, it is faster than other duck. The color of egg is green-tosca and the produce period around 2 years. That’s all the best duck breeds to farm dog eggs that actually can you find easily. Basically don’t be hesitated to learn something and don’t shy to consultation about which one is the best duck breeds if we want to farm egg. Basically duck business has hard competition because many people out there already being a pioneer but it doesn’t means that it can stop you. So please be spirit.